24th Canadian Infantry Battalion, C.E.F. Jack, the eldest of six children, was born in N.W. Leicester, England on June 4th, 1897 to Harry Chapman and Florence Cox. This area of Leicester was previously part of the village of Belgrave, since incorporated into the City of Leicester. By 1910, the family had fallen on hard times and were receiving relief from the Leicester St. Margaret's Poor Law Union. The Poor Law Union had devised a way to assist certain families in need by helping them emigrate to countries such as Canada. Harry and Florence were selected under this program and on May 20th, 1911, the family boarded the steamer "Dominion," operated by the White Star Dominion Line, leaving the shores of England for the last time. Jack was fourteen years of age and would have been a big help to the family during these trying times. The old steamer had seen better days and it took ten days to finally make its way to Quebec City. The family then boarded a CPR train to Montreal, their final destination. Harry found the family a temporary home in an old shed off Soulanges Street in Point St. Charles, a working class community south of Montreal's downtown core. When World War One broke out in August 1914, patriotism was high and thousands of men enlisted in the Canadian Expeditionary Force (CEF) then assembling at Valcartier, Quebec. In the fall of 1915, when Jack would have been of minimum military age (18 years), voluntary recruitment was already tapering off. By 1916, the booming wartime economy provided Canadians with other options and employers competed with recruiting officers for available manpower. Those keen to volunteer had already done so; the rest would have to be convinced or compelled. By the end of 1916, Canada's front-line battalions required 75,000 men annually, just to replace losses. In May 1917, Prime Minister Borden visited Vimy Ridge in the immediate aftermath of that costly Canadian victory and upon his return to Canada, the government began drafting the Military Service Act (conscription). The first group were called in January 1918, and Jack became one of 400,000 conscripted and registered as fit for service (of that number, only about 6% went to France and Belgium before the Armistice in November 1918). After his medical examination on January 5th, 1918, Jack was posted to "G" Company of the 1st Depot Battalion, 1st Quebec Regiment who occupied the old drill hall on Craig Street in downtown Montreal. The 1st Quebec Regiment provided drafts for two reserve battalions in England, which in turn provided reinforcements for six battalions in France. Jack was an ordinary Canadian soldier. He was 20 years old, 5-foot-8 and weighed 132 pounds, with fair hair and skin and blue eyes. He was assigned the regimental number 3080879, the high number characteristic of many of the MSA men. After a little local training in Montreal, Jack boarded the steamer "Scandinavian" which arrived in the United Kingdom on April 3rd, 1918 where he was quickly posted to the 23rd Reserve Battalion stationed in Bramshott, England. After four months of intensive training, he was posted to the 42nd Battalion (Royal Highlanders of Canada) then serving with the 2nd Canadian Division and stationed near Arras in Northern France. However, Jack was not to soldier with the Highlanders. Before reaching the 42nd, he was transferred to the 24th Battalion (Victoria Rifles of Canada), another well-known Montreal unit which were part of the 5th Brigade, 2nd Canadian Division. The transfer was likely due to the "exigencies of service" (the 24th and other units of the 5th Brigade had been almost totally destroyed during the Second Battle of Arras, with the 24th Battalion alone suffering over 650 casualties during the month of August). But the transfer started the sequence of events which would shortly take his life. Jack joined the 24th Battalion in the field on September 7th, and he, along with other reinforcements, must have been a welcome sight for the weary soldiers of the 24th. While conscripts had been snubbed and bullied on the training grounds, in France they met a very different reception for they at once entered the brotherhood of arms. "It is a melancholy scene. Down the Cambrai road through Vis-en-Artois, past Dury on the left and Vellers-lez-Cagnicourt on the right, all is desolate. It is a typical No Man's Land landscape. The countryside is pitted with shell-holes and scarred with trenches. Avenues of trees along the road show only blasted stumps. There is not a green thing. Everywhere is the debris of war, the litter and the ruin. Broken lorries, shattered remnants of an armoured car, the twisted rails of a light railway, scrap-iron of all descriptions, ammunition boxes piled high these things cumber the roadside. Everywhere are horses in various stages of decomposition. Here and there are rows of our dead, awaiting burial parties. Over all is a brooding stench of decay and stale gas." Being fresh from England and with no battlefield experience whatsoever, Jack must have been terrified at what he saw. On September 12th the 24th Battalion, with Jack in tow, left Croisilles and relieved another Canadian battalion in old trenches and dugouts at Cagnicourt. A few days later, in typical Army fashion, they marched back to Croisilles and boarded a train for Acq, marching from here to Agnez-les-Duisans, where they remained for a few days, enjoying excellent weather. After cleaning themselves up, they were inspected by their commanding officer, Lt.-Col. C.F. Ritchie. Soon, they were on the move again, marching back to Acq where they took the now familiar train to Croisilles. From here, they marched towards the front lines, taking over trenches occupied by the 29th Canadian Battalion. A draft of 93 men joined the Battalion on the move. On the morning of September 19th, the Battalion was getting ready for its move into the forward trenches, but due to congestion in the front and support lines (the Canadian Corps were building up for the assault on the Canal du Nord), they could not take more than 21 officers and 650 men into the line. As the trench strength of the Battalion was 21 officers and 700 men, 50 men had to be assigned to other duties. As Jack and the other conscripts had received little training and had no front line experience, they were likely the ones assigned to other duties. By late afternoon, things had been sorted out and the main body of the 24th proceeded forward to close support positions near Inchy-en-Artois where they relieved portions of the 7th British Battalion (Highland Light Infantry). The weather was fine and warm but comforts were few as heavy German gas shelling occurred throughout the day and into the night. Jack's life was now measured in hours. Like all front line battalions, the 24th would have organized carrying parties to move ammunition, water and other supplies between their forward positions near Inchy, and supply depots in Arras. Jack was likely with such a party and on Saturday evening, September 21st, he found himself in a quiet part of the support trench system near Tilloy-lez-Mofflaines, a few miles east of Arras, but some 13 miles from his Battalion's forward positions at Inchy. While certainly less exposed to artillery fire than positions further east, Tilloy was well within the range of German artillery located south and southwest of Douai, as well as within the reach of heavy artillery positioned east of the Canal du Nord. Intelligence also reported a long-range Railway gun operating in the area. During this period, the entire Canadian Corps sector was hammered by German artillery, with long-range shells regularly hitting Arras, "plastering the railway station and yards." As Sunday morning, September 22nd approached, Jack's life was measured in minutes. Just before dawn a shell exploded besides Jack, killing him instantly. He was buried in a temporary grave close to the spot where he died. His Battalion's War Diary for that day coldly and simply states: "Nothing unusual to report...Casualties two killed and two wounded..."
By 1918, so many had fallen that battalions had developed a routine for dealing with the dead. Usually, the soldier would be buried in a temporary grave close to where he was killed, with the location recorded using trench map coordinates. When it came time for permanent burial, their bodies were exhumed and concentrated in local cemeteries with the trench map coordinates helping to locate their remains. For some unknown reason, the map coordinates of Jack's remains were never recorded. He may still lie under a farmer's field in the French countryside; or he may rest under one of so many stones engraved with the simple phrase, "An unknown Canadian soldier. Known unto God." It is interesting to note that there are a number of cemeteries close to Tilloy which have unidentified Canadians. Of the four men killed during the 24th Battalion's brief tour of duty in the Inchy sector, only Jack's remains were never unidentified. The remains of Privates Jean Rainville and Ruben Kramer were buried, straight from the battlefield, to the nearby Queant Communal Cemetery (British Extension). The remains of Private Joseph Phillips were buried in a temporary grave and later concentrated in the Queant Road Cemetery. "Pte. 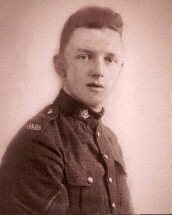 Jack Chapman, who was killed in action on September 22nd went overseas with a draft of one of the Montreal depot battalions last March. He was born in Belgrave, Leicester, England, 21 years ago. Before going overseas he was employed in the shipping room of the Northern Electric Company, Limited. His parents reside at 80a Grand Trunk Street, Point St. Charles. His uncle, Pte. Charles Chapman, was taken prisoner by the Germans during the retreat at Mons." To help them remember their lost son and brother, one year later, the family received a solid bronze plaque to accompany the scroll. The round plaques, known as "death pennies" and "widow's pennies," are almost five inches across. Jack's plaque bears his full name, without any indication of rank or honours, to show equality of sacrifice. The plaques were shipped with the following message of condolence signed by King George V: "I join with my grateful people in sending you this memorial of a brave life given for others in the Great War." More than a million families in the British Empire received similar scrolls and plaques. Receiving these memorials so long after Jack's unfortunate death must have caused additional heartbreak to an already grieving family. displayed for public viewing in the Chapel of the Parliament of Canada in Ottawa. Its title page reads: "Here are recorded the names of the Canadians who, loyal to the Crown and faithful to the traditions of their fathers served in the Canadian and other forces of the British Empire, and gave up their lives in the Great War 1914-1918." Page 383 is displayed every year on August 20th. Copyright © Earl Chapman, October, 2000.